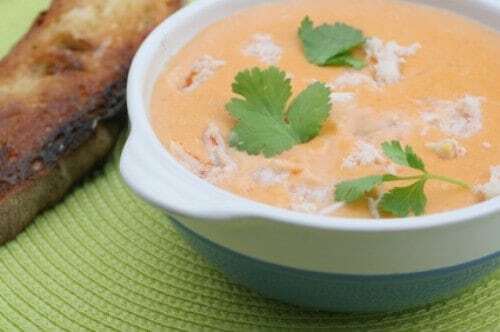 Make Marina Cafe Seafood Bisque at home. Melt the butter in a heavy bottom pot and saute onions, garlic, celery, and tomatoes for 10 min. Stir in the flour until all is incorporated. Slowly add sherry, white wine, cream and milk, stirring continuously. Bring to a slow boil. Add all of the seafood ingredients, lemon juice, green onions, and paprika. Bring back to a slow boil. Simmer for 20-30 minutes add the basil and season to taste with salt, black pepper, and cayenne. Love this soup. I have to leave out tomatoes, paprika and cayenne pepper, due to allergies, but it’s still delicious. I have made it with canned crab and canned mini shrimp, as well as large shrimp and scallops, depending on what I have on hand. I add flounder or tilapia. Any fish will add body and yumminess. I use flounder. You can use any fish you like! I like cod or haddock or hake soaked overnight in milk then cut into one inch cubes. Stays together real nice without falling apart. This is the best seafood bisque I have ever had. I make this every holiday and there is never any left. It’s a little pricey to make, but well worth it.